I did a story a few weeks back about the next month or so of winter and spring as we go through the ups and downs between the seasons. In it I talked about not eating lettuce this time of year or packaged greens. This is a huge part of making the choice to eat seasonally. I plan to write more on this as you guys asked, but greens in the store this year are usually lacking nutrients because of the distance they traveled to get to you and they typically have been grown in mass so the care that is intended to be given to them has been either automated or they have been bread to no longer need it. Needless to say your greens in plastic containers and bags are not what they should be so instead, choosing other things to make “salad” out of that are far more available and in-season in your area is the better choice. By choosing to eat seasonal/local we can get a higher density of nutrients in our diet meaning we can spend less. Though typically buying in season vegetables is cheaper in general. So forget the regular salad you eat with tomatoes and spring mix and instead let’s enjoy some new takes on salad. What do you think? Just because this salad doesn’t have lettuce, does not mean it isn’t a salad. I am calling it a slaw because it is more or less a slaw, but it is FULL of raw veggies. Nothing is cooked and it high in all the things you need to fend of colds, flu, and other ailments this time of year. Isn’t it amazing how the seasons give us what we need to be our best? I find it fascinating. 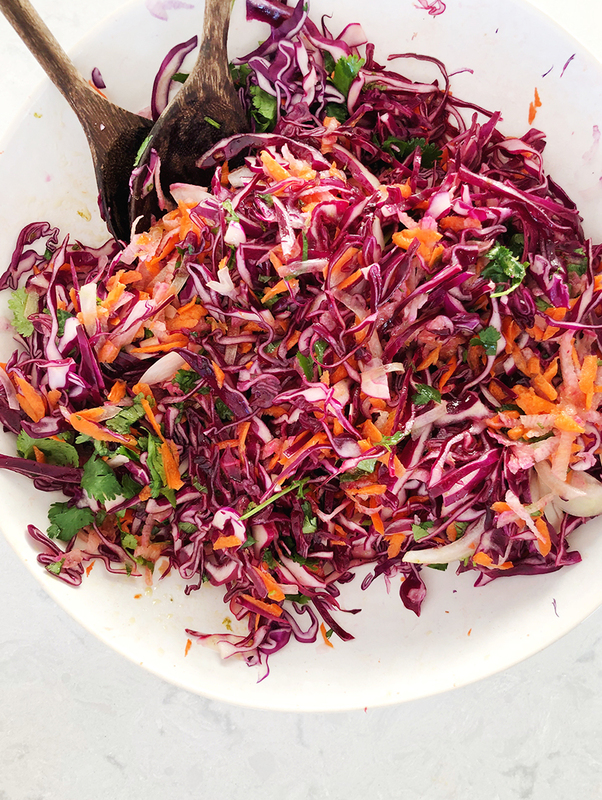 Anyways, this slaw/salad is perfect on its own for lunch or we top tacos with it or even serve it beside proteins with a legume of some kind. You could also easily add in Quinoa to this and have your protein added into it. It is extremely versatile and can be mixed with various veggies in nearly any season as well. I love recipes like this because they are simply launching points for us to find a way to eat what is available to us. *I want to make a note here that citrus is not local for us. We do purchase it though because lemons and limes are an essential part of a diet for us. We use them sparingly and with a lot of intention and most often when they are in-season in the citrus states which is the winter. We try to keep our purchasing of all food within the US and our awareness on what is abundant in the US at certain times of year. ONE: Wash and open cabbage head. Cut into a chunk you can run on a mandolin. Shave the cabbage on the mandolin down as far as you can. Watch your fingers though! Add all of this into a bowl you plan to mix everything in. TWO: Grate carrots and radishes into the same bowl with the cabbage. THREE: Mandolin red onion and fennel into the bowl with the cabbage as well. SIX: Place all dressing ingredients into a jar you can place a top on to. Shake vigorously and taste. Add salt and pepper or vinegar as needed. SEVEN: When ready to serve, pour dressing onto slaw a little at a time mixing and checking flavor. Once at the right place the dish is ready to serve. 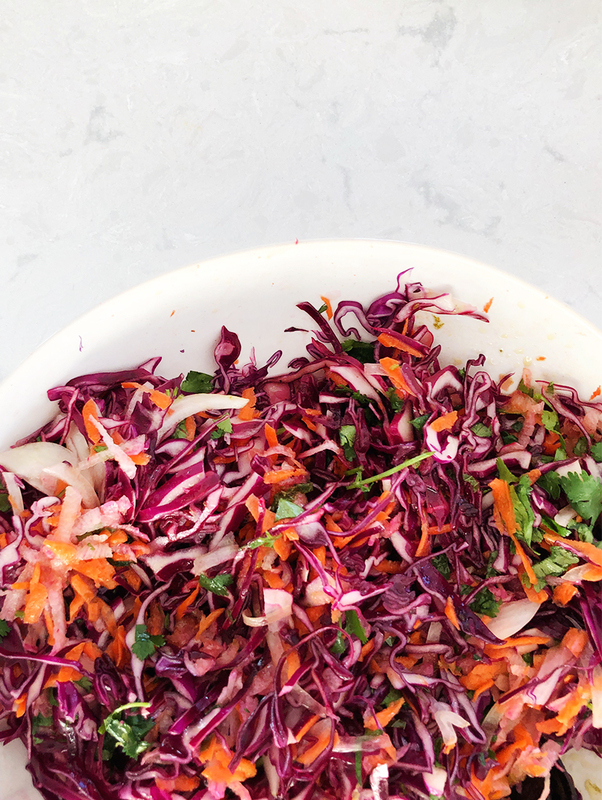 We are big fans of this slaw and I have found it really cures those cravings for crunch veggies in the dead of winter. I love how colorful it is and good for you. It also is a little different each time we make it depending on what is available to us in the moment. 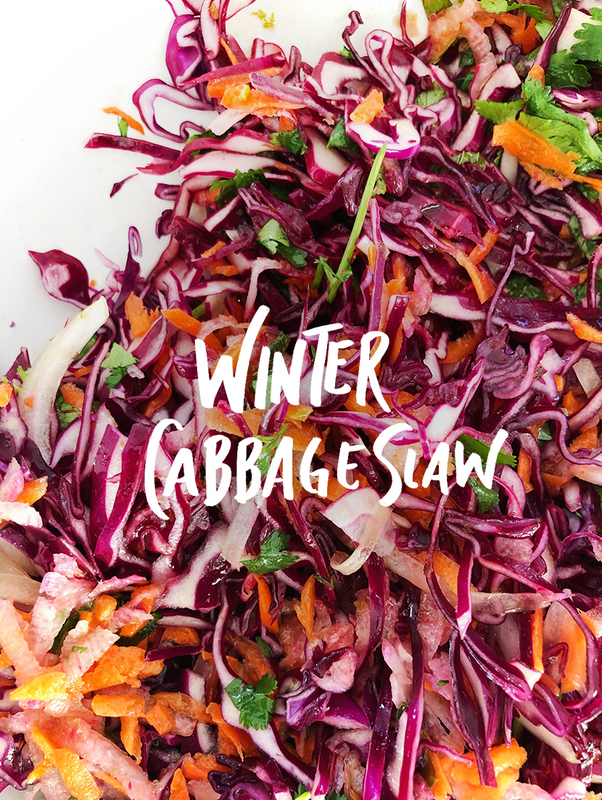 Do you have a favorite winter seasonal salad or slaw you eat? I eat this all the time. I like to add red beans and corn (both canned), which provide a complete protein. Or quinoa. It also makes it more filling, good for lunch on its own. Sometimes I get tired of cabbage and use grated beets. I mix up the dressing–sometimes it’s olive oil and red wine vinegar, sometimes it’s peanut and sesame oil with rice wine vinegar, sometimes olive oil with balsamic vinegar….That and different spices (cumin one day, chimichurri another, basil another) make it taste very different, even if the basic vegetables are mostly the same. Love this! The more I follow you and read your content, the more I desire to really learn and lean into a more seasonal life, especially with cooking. Definitely gonna give this slaw a try in the coming week! Thanks for sharing!